Trapping for great crested newts came to a close on 31 October. So far we have trapped and relocated over 70 great crested newts and close to 100 smooth newts and toads (exact figures being collated). As expected the combination of pitfall trapping, netting and night searches under torchlight have proved to be the most effective methods of amphibian translocation. The highest count was made on a mild damp evening in mid-October, when 8 great crested newts and 20 smooth newts were found. Between now and mid-February the fences will be checked and maintained in case of damage. Most of the compartments in the site compound have now been fully trapped and released to development / demolition. Those compartments closest to the emergency water tanks will continue to be trapped (starting around mid-February), and so too will a number of compartments beyond the site compound where we still expect to find newts in the spring. Between 29 and 31 October the emergency water tanks were drained and just one great crested newt and five smooth newt larvae were netted, indicating that earlier netting had been successful in removing the majority of the amphibians. On 31 October the walls to the two tanks were breached. No further amphibians were discovered in the sludge on the pond bed despite thorough searches by the ecology team. Since the end of October and into November, scaffolding has been erected around the buildings in the site compound. Stripping of roof tiles and other materials under which bats may be roosting commenced on 3 November, under strict supervision of a licenced bat worker, and will continue for the next few days. So far no roosting bats have been found, although this is not an unexpected result, since the bat roosts were recorded as being transitional, such that bats may now be occupying other sites where they will soon be looking to hibernate with the onset of the cooler weather. Once the roof strip has been completed, the buildings will be demolished, targeting first those within compartments that are fully cleared of amphibians. 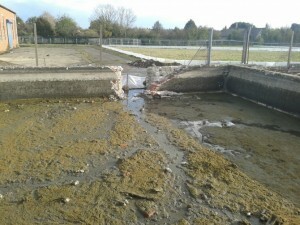 One of the drained tanks, having been breached at the eastern wall.